Thank You! To everyone who joined us and made our 40th Celebration event and photography exhibit possible! This year, VPLC celebrated 40 years of serving low-income Virginians and the quest to ensure equal access to justice. 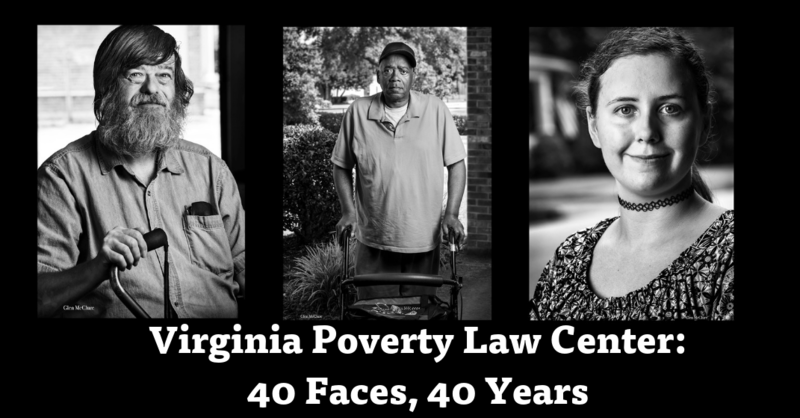 Virginia Poverty Law Center: 40 Faces, 40 Years is a photography event featuring forty Virginians who qualify for legal aid services. Virginia Poverty Law Center: 40 Faces, 40 Years aims to enhance awareness of underrepresented and underserved groups by visually illustrating our commonality. Glen McClure is the photographer and his work has been featured at many prestigious museums and is in many private collections.